So you know the card that a bunch of people were using to showcase their awesome games at E3 this year? I'm talking about Nvidia's GTX 780. The card that helped many of Microsoft's games look like they were worth a $10 million. Well, that card just got absolutely destroyed like France during World War II in the benchmarks against AMD's Radeon R9 290X. WCCF Tech compiled the benchmark rundowns from top tier hardware enthusiast sites, just so everyone would know that it's not a one-off chance that the 290X owned on Nvidia's 780 like it was a soap-dropping prison ho. Now there were some stipulations in place. AMD limited benchmarks to Tomb Raider and Bioshock Infinite. In a way, you have to admit that those are fair bets given that the obvious choice of Battlefield 4 is an AMD fanboys wet-dream game come true and designed from the ground up with Mantle in mind. Technically, the Frostbite 3 has been re-engineered for AMD's Mantle, so anything from EA is basically AMD fanboy territory. Nevertheless, Tomb Raider and Bioshock Infinite at 4K resolutions (3840x2160) pumped out so mean results with Legit Reviews capturing the R9 290X in quiet mode averaging 44.25 frames per second where-as the 780 only managed 37.67 frames per second in Bioshock Infinite. Take note that this is absolutely crushing to supposed next-gen consoles that can barely maintain 720p at 30 frames per second. Embarrassing. 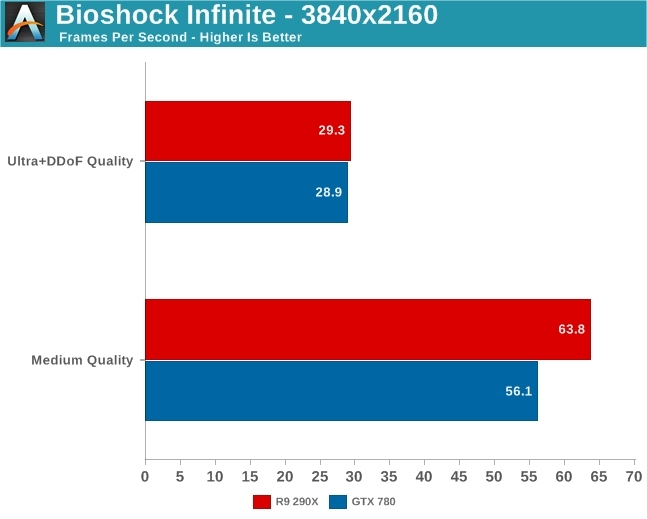 AnandTech's benchmark was also just as eye-opening, as the site's benchmark of Bioshock Infinite rendered 29.3 FPS for the R9 290X with everything maxed out at 4K, but they were able to get a stable 63.8 FPS from the 290X on medium settings. The GTX 780 only managed 28.9 FPS on ultra and 56.1 FPS on the medium settings in Bioshock Infinite. According to Tom's Hardware, the R9 290X stomps a mudhole in the GTX 780 at 4K resolutions on the ultra settings in Tomb Raider, managing 30.6 FPS where-as the 780 sputters out at 27 frames even. Tom's Hardware also tested Bioshock Infinite on the very high graphics settings at 4K resolutions and found that the R9 290X managed 53.5 frames per second consistently during the game's opening cinematic, where-as the GTX 780 underperformed like a depressed middle-aged man at only 46.2 frames per second. While it's only two games and in rather strict benchmarking conditions, we can easily see that the R9 290X is no slouch and marks out at a speculated $650 price-point, which not only beats the GTX 780 in benchmarks but potentially pricing as well. The only thing lacking in the benchmarks was a run-up against the current king of the GPU hill, the GTX Titan. Still, being able to beat the little brother of the Titan is big news. Combined with absolute control over the console market with their Jaguar APU architecture and their support of open-source design with Mantle, AMD is looking to control this generation of gaming like never before. Now it's a question of if Nvidia can even keep up?